On this date in 1940 the German Luftwaffe conducted its first bombing raid on London, the British cap­i­tal, four months after assaulting the Polish cap­i­tal, War­saw, at the start of World War II in Europe. Five months later, on May 10, the Royal Air Force retal­i­ated with its first stra­tegic bombing raid on Ger­many. On Novem­ber 14, 1940, nearly 450 Ger­man bombers rained more than 500 tons of high-ex­plo­sive bombs and some 56 tons of in­cen­di­ary bombs on the Eng­lish medi­e­val cathe­dral city and in­dus­trial-muni­tions center of Co­ven­try. The raging in­fer­no de­stroyed or damaged 80 per­cent of the city cen­ter, including its cathe­dral, and about three-quarters of the city’s fac­tories. Civil­ian dead num­bered 568. 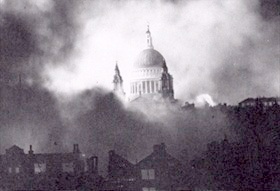 Next year, in mid-April 1941, the Luft­waffe bombed and damaged Lon­don’s St. Paul’s Cathe­dral, ini­ti­ating the final phase of the Lon­don Blitz, which reached a cli­max on May 10 with a raid on the Brit­ish capi­tal that hit the House of Com­mons, West­min­ster Abbey, and the Brit­ish Muse­um, leaving a third of Lon­don’s streets im­pass­able, 1,400 civil­ians dead, and 1,800 in­jured. The prin­ciple of pro­por­tion­ality—en­suring that damage to non­com­bat­ants was not out of pro­por­tion to the po­ten­tial mili­tary ad­van­tage—was for­ever laid to rest when the RAF and the U.S. Eighth Air Force, which was based in Britain, fire­bombed Ger­many’s second largest city, the port city of Ham­burg, in late July and early August 1943. The British threw 2,355 sorties at Ham­burg in three mas­sive night­time raids on July 24–25, July 28, and July 30, and the Eighth Air Force gen­er­ated 235 day­light sorties in two raids on July 25 and 26. Oper­a­tion Gomor­rah—the “wrath of God” nature im­plied in its name—pre­cip­i­tated a fire­storm of bib­lical pro­por­tions that killed at least 40,000 civil­ians who were blown apart, burned in the above-ground flames and melting asphalt of city streets, or were asphyx­i­ated as they huddled in base­ments and bomb shelters. The 1945 air offensive against Nazi Ger­many—a kind of war with­in a war con­sisting of 404 day- and night­time bombing raids between Janu­ary 2 and April 22, when the last stra­te­gic bombing raid took place—left that nation com­pletely crippled and in­cap­able of mounting the sort of ground de­fense that was needed to fend off Allied in­vasions on the western and eastern fronts. 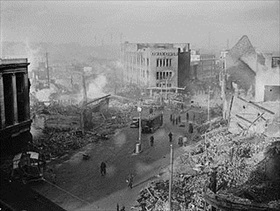 Left: Broadgate in Coventry city center on Novem­ber 16, 1940, following the Coventry Blitz of Novem­ber 14/15. The burnt-out shell of the Owen depart­ment store, opened in 1937, overlooks a scene of devastation. Right: The Coventry Cathedral provost and a party of helpers attempted to deal with the first set of incen­di­ary bombs that burst through the cathe­dral roof and walls by smothering the flames with sand. But another shower of incen­di­aries accom­panied by high explo­sives, oil bombs, and land mines forced the party to give up its efforts. By the next morning only the skeleton of the cathedral was left standing. Left: London’s St Paul’s Cathedral, undamaged, ringed by clouds of smoke in this iconic photo­graph taken on Decem­ber 29, 1940. 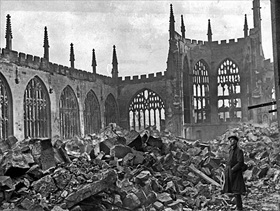 The cathedral was struck four times—in September, October, and December 1940 and in April 1941—during the Blitz, the period from fall 1940 through spring 1941. Less familiar in the public’s mind was the Luft­waffe’s Blitz that occurred between January and May 1944. Opera­tion Stein­bock, as the Ger­mans called their final air cam­paign over Britain, cost the Luft­waffe dearly—330 air­craft and their crews, or one bomber and four trained crew­men killed or captured for every five people killed on the ground. 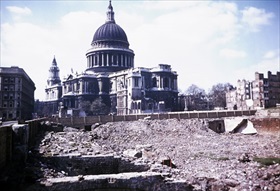 Right: Color image shows the destruction of many of the buildings surrounding St. Paul’s Cathe­dral, which remained largely undamaged. The Ger­mans delib­er­ately targeted the “Square Mile,” the heart of the London and the site of some of its greatest landmarks. 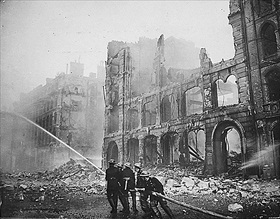 Left: Firefighters put out a blaze in London after an air raid during the Blitz in 1941. 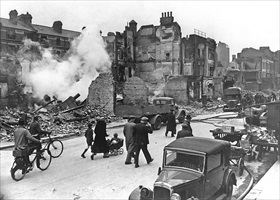 Less than half­way into the 37 weeks of the Blitz (Septem­ber 7, 1940 to May 10, 1941), the Luftwaffe had dropped more than 13,000 tons of high explo­sives and nearly 1,000,000 in­cendiaries on London. Right: A street of ruined houses in London. More than one million London houses were destroyed or damaged and close to 20,000 killed during the 267 days of the Blitz. Following the Blitz the Germans began firing V‑1 and V‑2 rockets into the Greater London area, destroying 24,000 houses and damaging a further 760,000 dwellings and ren­dering them unin­habit­able. Total British personnel losses in air raids during World War II were approximately 60,000 dead. 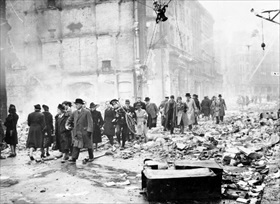 Left: Following an intense overnight raid, Londoners summoned up their “blitz spirit” to navigate through rubble-strewn streets on their way to work. 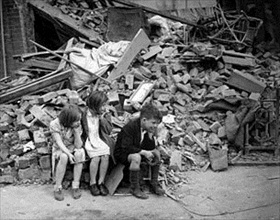 Right: Children of an eastern suburb of London made homeless by the Blitz. Though militarily ineffective, the Blitz caused enormous damage to Britain’s infra­structure and housing stock.